Lafayette County, Missouri; c.1898. Permission of Edna Anna Clara (Begemann) Struchtemeyer; all rights reserved. 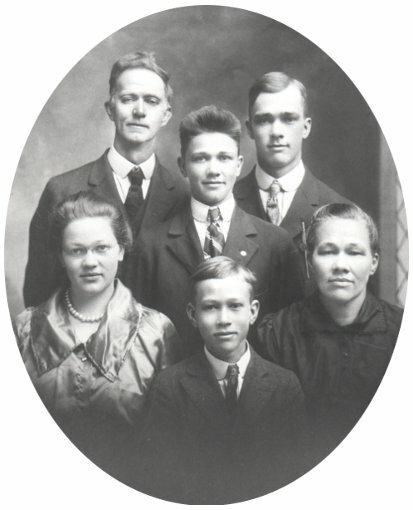 Wilhelm & Henriette (Starkebaum) Fiegenbaum and young family, about 1898. 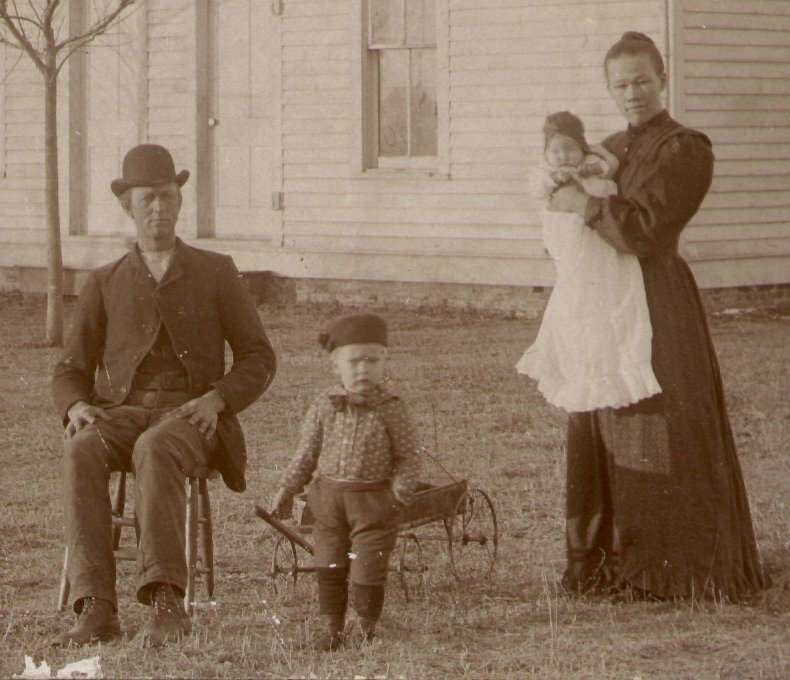 Wilhelm Friedrich Fiegenbaum seated in the chair, Martin Herman Fiegenbaum with his wagon and Henriette Caroline Amelia (Starkebaum) Fiegenbaum, holding her daughter, Emma Florentine Fiegenbaum, pose in front of their home. Emma was born in September 1897. There appears to be a small remnant of snow lying in the shadow of the house. It might not be too far-fetched to guess this photo was taken in the Spring of 1898. This residence, which for the sake of convenience I have taken to referring as the Fiegenbaum-Starkebaum farm, was located in Washington Township, south of Mayview, in Lafayette County, Missouri. In later times, the neighborhood included a gas station and country store was known locally as Fortyville. Commercial bus lines, using nearby U.S Route 40, would stop here. The two front doors, the two side-by-side panes in each window sash, and the single chimney in the center of a gabled roof help to identify this as the house which existed on the site until it was replaced about 1914. This farm was home to the Wilhelm Friedrich & Henrietta Caroline Amelia (Starkebaum) Fiegenbaum family and the Edwin Friederich Fiegenbaum and Lucille Marie Caroline Rinne family. Later, the farm passed to Henry Martin & Mary Ellen (Schmutz) Fiegenbaum, who lived a short distance east of Fortyville on a farm on Douthit Road. Detail of photo shown above. Lafayette County, Missouri. Permission of Edna Anna Clara (Begemann) Struchtemeyer; all rights reserved. Front row, left to right: John Henry Fiegenbaum; Edwin Friederich Fiegenbaum. Back row, left to right: Emma Florentine Fiegenbaum; Martin Herman Fiegenbaum. Lafayette County, Missouri; c.1914? From Fiegenbaum-Gerber family; all rights reserved. Front row: Emma Florentine Fiegenbaum; Edwin Friederich Fiegenbaum; Henriette (Starkebaum) Fiegenbaum. Back row: Wilhelm Friedrich Fiegenbaum; Martin Herman Fiegenbaum. Lafayette County, Missouri; 1912?. From Fiegenbaum-Gerber family; all rights reserved. Front row, from left to right: John H. Fiegenbaum; Edwin F. Fiegenbaum. 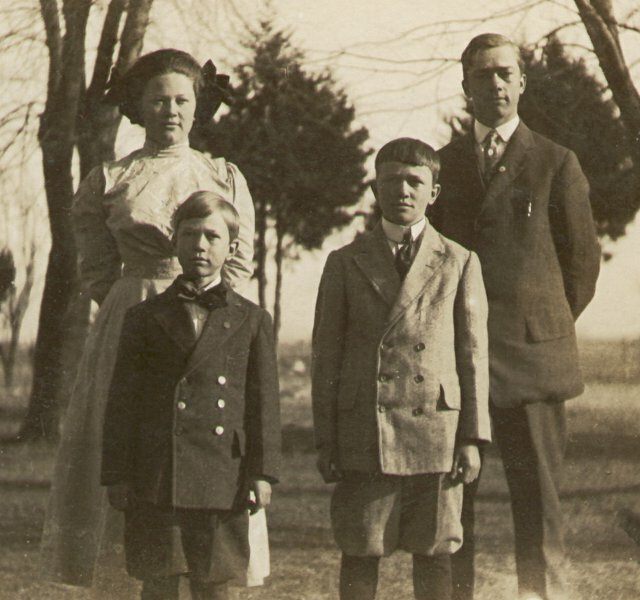 Back row, from left to right: Martin H. Fiegenbaum; Emma F. Fiegenbaum. 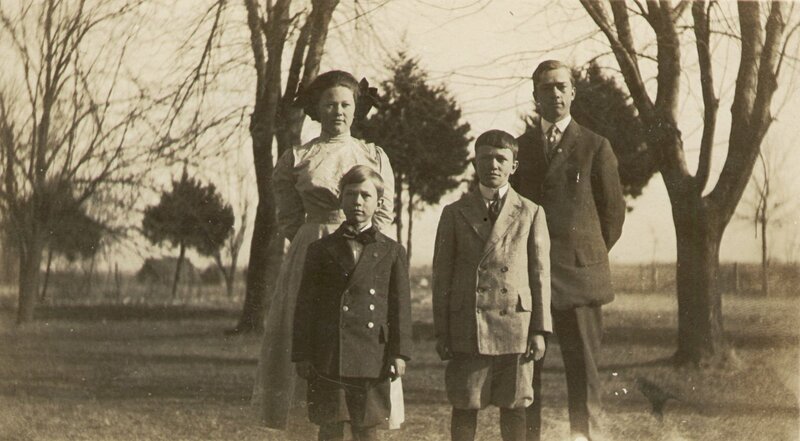 I believe this photo was taken on the Fiegenbaum-Starkebaum farm, south of Mayview, Missouri. 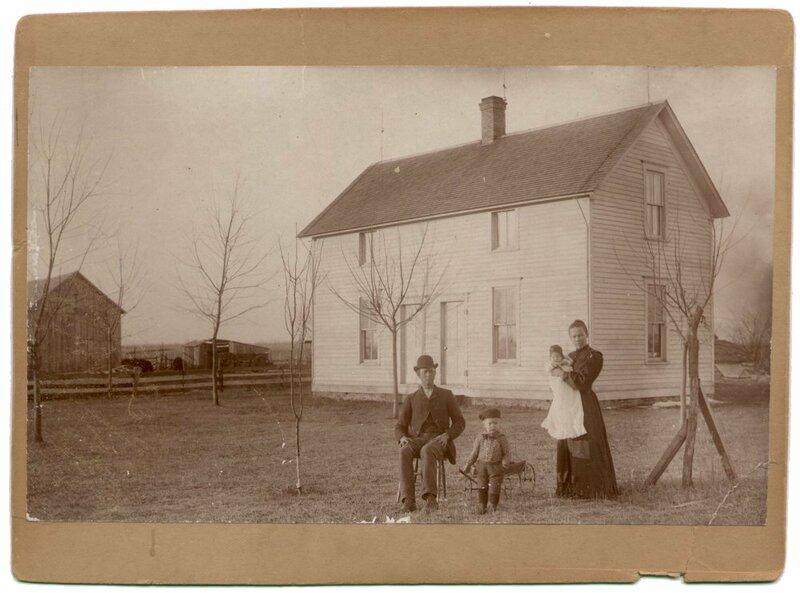 Judging by some of the features of the house (the type of window panes, the downspout high across the side of the building, a front porch that does not enclose the windows), the photo would have been taken before 1914, when a new house was built on the farm. 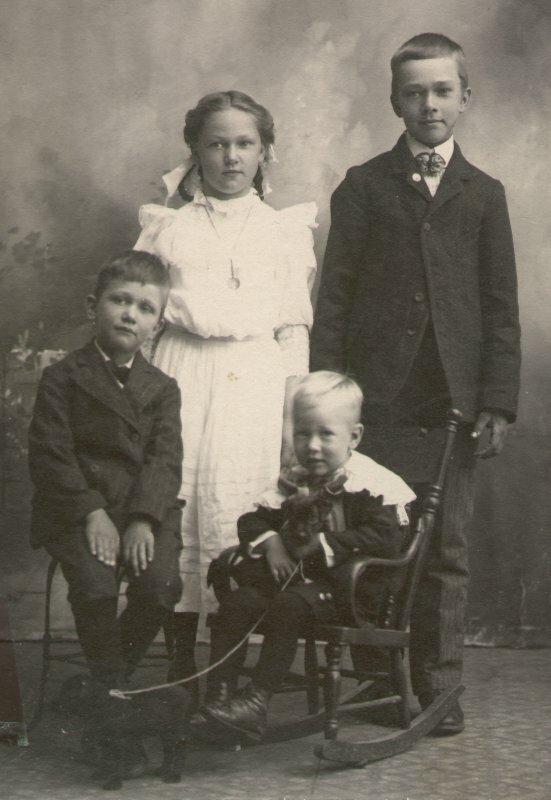 In fact, I believe the clothing the children are wearing matches what appears in the very next photograph, which was printed as a postcard that was mailed in early January 1913. That might suggest that the photo was taken in 1912 - perhaps in the autumn of the year (judging by the absence of leaves on the trees and Emma's coat). Lafayette County, Missouri; 1912?. Permission of Irene Henrietta Wilhelmine (Begemann) Knehans. Front row, left to right: Edwin F. Fiegenbaum; John H. Fiegenbaum. 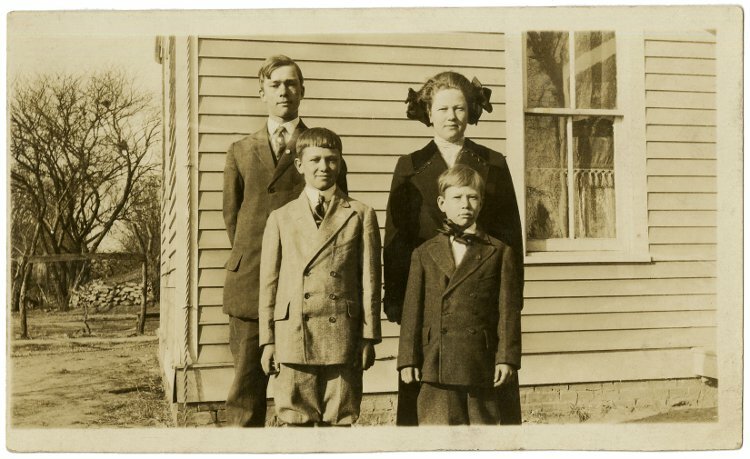 Back row, left to right: Emma F. Fiegenbaum; Martin H. Fiegenbaum. 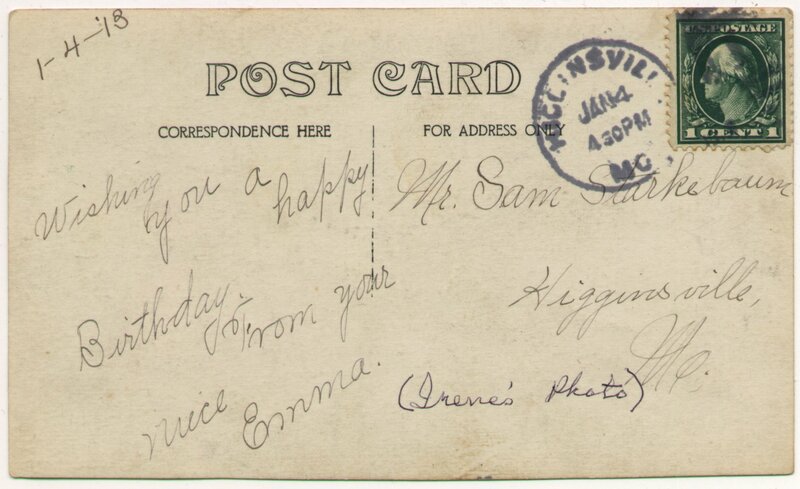 This image is taken from a larger photograph printed as a postcard which was mailed on 4 January 1913 at Higginsville, Missouri by Emma Fiegenbaum as a birthday greeting to her uncle, Sam Starkebaum (Samuel Heinrich Albert Starkebaum was born on 6 January 1893). That might suggest that the photo was taken in 1912.